Golf Academy of America in Phoenix announced today that every one of its students volunteered at the Waste Management Phoenix Open. The fundraising tournament provided students with the opportunity to see golf professionals up close and learn how a large tournament operates. The chance to be up close to the PGA professionals while they are hitting golf balls is the highlight for most of the volunteers. 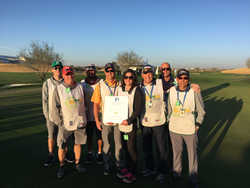 Golf Academy of America proudly announced today that all of the students on its Phoenix campus volunteered for the Waste Management Phoenix Open, which took place Monday, January 29 - Monday, February 5. This was the 15th year the school has volunteered at the fundraising tournament. The Golf Academy of America students, along with some graduates and family members, filled 140 volunteer slots. Some students took on two shifts, while others chose to volunteer for three, depending on what their schedules allowed. Tim Eberlein, Campus President of Golf Academy of America in Phoenix, coordinated the volunteers. Eberlein has sent students to the event annually since 2003, when he was first put in contact with the club where the open is hosted, TPC Scottsdale. The volunteer slots spanned the full week of the Waste Management Phoenix Open, beginning with practice rounds through and including the final rounds. From 6 a.m. until 7 p.m. daily, Golf Academy of America volunteers were responsible for running the driving range. "The chance to be up close to the PGA professionals while they are hitting golf balls is the highlight for most of the volunteers," said Eberlein. "It's a great student experience, and it's a top perk of being a student." Volunteer duties included maintaining the short game area, picking the driving range, setting up hitting stations, washing the golf balls and sorting the balls by brand so each professional could practice with their particular golf ball. In addition to getting up close and personal next to golf professionals, the Golf Academy of America student volunteers benefit from a tournament operations standpoint. The Waste Management Phoenix Open gives them a unique opportunity to see a large-scale event, observe how to set up a range properly and take note of what it takes to maintain the range during the event. In exchange for their time volunteering, each Golf Academy of America student received a free pass to the tournament for the entire week.